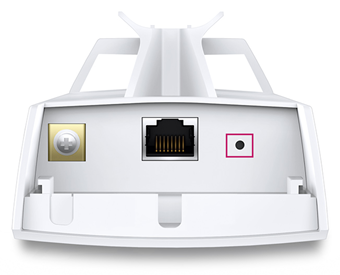 How to Restore TP-Link Pharos Series Products to Factory Defaults? Note: The reset operation will remove all your settings, and your device will be restored to factory default settings. Do not perform a hard reset unless you have backed up your settings or you can do the configuration again. 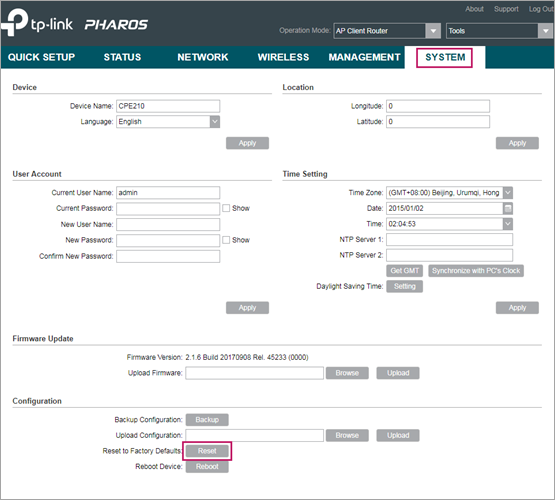 There are three methods to reset TP-Link Pharos series products to factory defaults. With the device powered on, directly press and hold the reset button on the product for about 8 seconds until the Wireless Strength LEDs flash. Then release the button and wait for the device to reset to its factory default settings. With the device powered on, directly press and hold the remote reset button on the PoE adapter for about 8 seconds until the Wireless Strength LEDs flash. Then release the button and wait for the device to reset to its factory default settings. Visit the PharOS configuration interface through a web browser. Then go to the SYSTEM page. In the Configuration section, click Reset and wait for the device to reset to its factory default settings. The reset process may take several minutes, please wait without any operation. After the reset, you can use the default access information that can be found on the product label to log in the device. Был ли этот FAQ полезен? Ваш отзыв поможет нам улучшить работу веб-сайта. Вы хотите добавить что-нибудь ещё? Как мы можем это улучшить? Нажмите здесь, чтобы связаться с технической поддержкой TP-Link.